Gallifreyan Farm is a small start-up farm in Northern Maine that focuses on alternative and sustainable agriculture and fiber. With two “grandmonkeys” in the family, and a growing number of local friends who participate in 4H, we had some long discussions about how we could get the grandmonkeys interested in 4H, and learning about animals and gardening and how everything in the world around us has its place and purpose. We did some digging around and discovered that most kids were showing rabbits and alpacas, and even joked about keeping a couple alpacas at the house. Our original rabbits: Remy, Max, Logan and (not pictured) Hank. Our research into rabbits introduced us to angora rabbits. Not only are these beautiful animals, but their fur is used for spinning yarn. We drilled deeper into the world of angora rabbits to discover what is considered the best fiber breed out there: German angora. 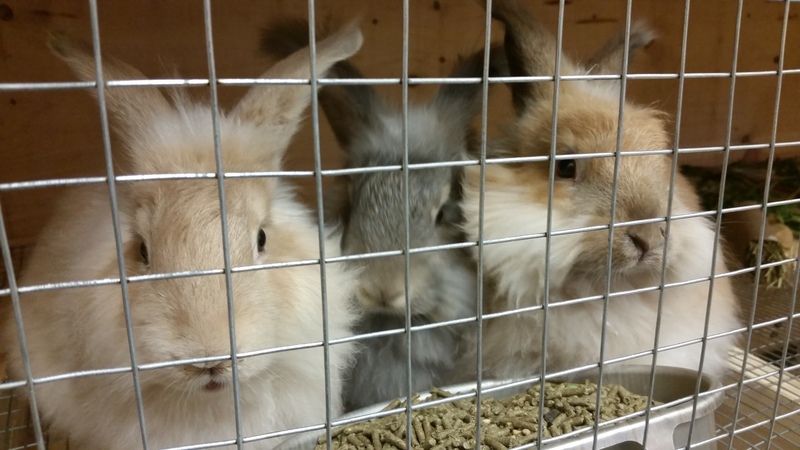 We found a breeder downstate (who is since retired), and on our way there, we found the French/English angora boys, who have been a staple on our farm’s promotional material. 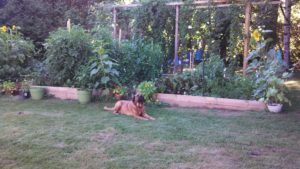 Soon we added Roger and Molly, our first German angoras, then came Snow Shoe, Miss Attitude, and Cedar, then Robin and Anna Marie (French angoras), then.. then.. then.. So it turns out that rabbits multiply quickly, even if they aren’t bred! 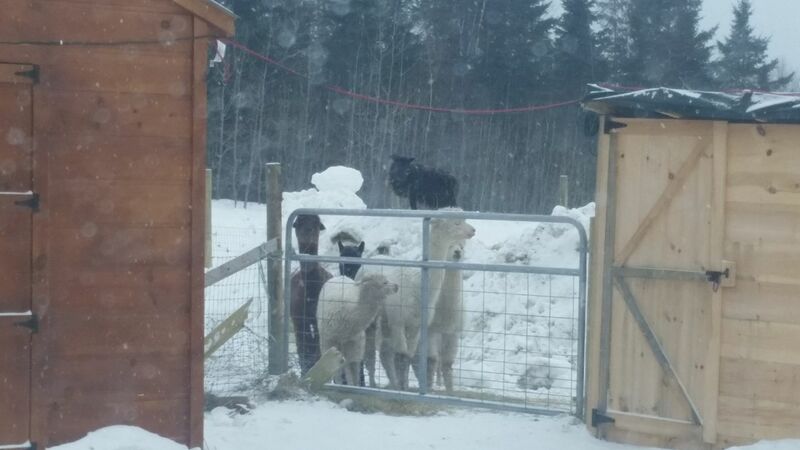 The pacas and sheep enjoying a snowy day in Northern Maine. We are fortunate to have a yarn mill right here in The Country: Aroostook Fiberworks. Andy has been a fantastic guy to deal with, and one day, while we were picking up the latest yarn order, he asked us: “Did you guys have any interest in some alpacas? I will make you a hell of a deal…” We were, and he did, and talk about a “trial by fire”; we were pretty clueless going in with alpacas, but it’s been quite some time, and they are thriving, and we really couldn’t be happier. More recently, we added a male cria from RMT Farms, who will be a fine fine flock stud, when we let him, and then had a trio of gorgeous Icelandic sheep somewhat fall into our laps from Kilby Ridge Farm. So, yes, we do have sheep. And alpacas. 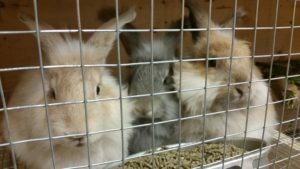 And angora rabbits. Fun fact: Angora wool comes from angora rabbits, but mohair comes from angora goats. Why is that? Because goats have “mo’ hair” than rabbits! Few farms do as many events in a year as we do. Our setup at our first event: the Houlton Craft Fair. It all started with a week’s notice that we’d been accepted at the Houlton Craft Fair one year. Boy, did we scramble to get prepared for that! While we had some of our Merino/Angora yarn available, that was about it. We had some bits of dyed roving that we’d outsourced then hand-dyed, and some felting tools, but it really threw us for a loop because we were in no way prepared for such a big event. Oh! We did have wool dryer balls, and sold nearly an equal amount as dryers balls as we did as cat toys. For those of you who met us for the first time at that craft fair, you were a first-hand witness as to the power of determination blended with a healthy dose of fear and panic. After the two brutally long days of completely flying by the seat of our pants, we were done as quickly as we’d started. We survived! We sold out of dryer balls (cat toys), and were lighter a lot of skeins of yarn and hand-dyed roving. One of us even stabbed himself while learning how to needlefelt (pro-tip: Those needles are barbed. Avoid stabbing yourself, because it really hurts.) We were elated, because we felt that the Farm had an excellent showing, and we learned a lot on running a booth. Our friend Jon holding Ellie. 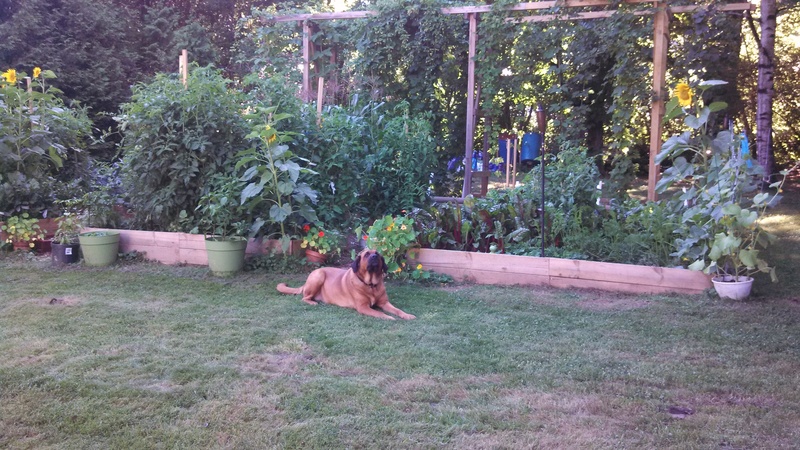 Over our first summer, we were mainstays at the Houlton Community Market in Market Square, as well as Tractor Supply. 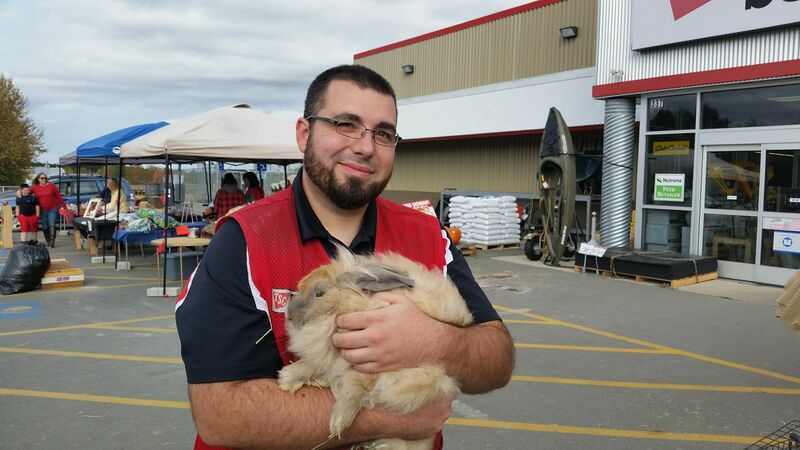 We made a lot of friends in both places, especially when we’d bring a rabbit or two to show off. Some weekends, there were conflicting events, so we’d divide and conquer and do both of the events. Being invited to the Southern Aroostook Rural Living Days was always a goal of ours, but we weren’t expecting it to happen during our first year of operation. We took Robin and Remy’s litter of juvenile rabbits for show n’ tell (and for sale), as well as Miss Attitude so that we could do a shearing demonstration. Being accepted into the Millinocket Marathon and a Half Artisan Fair was mind-boggling. And so many more smaller events, and we loved them all, big and small. Because we don’t get to enough of other events, the Farm is hosting several now, to include the Southern Aroostook Fiber Artists group, as well as the Li’l Growers program. We will continue to grow and expand, and it’s all thanks to you.